- Publisher One of the premier issues that divides Protestants from Roman Catholics is the question of the place of Scripture. Protestants declare that the scriptures alone are the rule of faith and practice, while Roman Catholics assert that it is Scripture and the traditions held by the church that constitute the final word on a matter. This debate is not new. The volume you are holding was first printed in 1588, and deals with that very question. During his lifetime, William Whitaker entered into many public debates and disputes with Roman Catholic scholars, and is said to have exposed all their arguments as fallacious. Robert Bellarmine, perhaps the most notable Roman disputant, was seen by the Roman church as an invincible champion. Dr. Whitaker defended Protestantism so well that one observer said that "he cut off the head of his antagonist with his own weapons." In this important work, he deals with the number of canonical books, the authority of Scripture, the perspicuity (clarity) of Scripture, the proper interpretation of Scripture, and the perfection of Scripture against unwritten traditions. 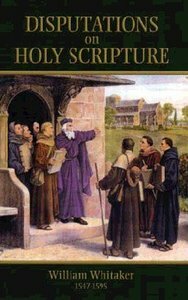 About "Disputations on Holy Scripture"
One of the premier issues that divides Protestants from Roman Catholics is the question of the place of Scripture. Protestants declare that the scriptures alone are the rule of faith and practice, while Roman Catholics assert that it is Scripture and the traditions held by the church that constitute the final word on a matter. This debate is not new. The volume you are holding was first printed in 1588, and deals with that very question. During his lifetime, William Whitaker entered into many public debates and disputes with Roman Catholic scholars, and is said to have exposed all their arguments as fallacious. Robert Bellarmine, perhaps the most notable Roman disputant, was seen by the Roman church as an invincible champion. Dr. Whitaker defended Protestantism so well that one observer said that "he cut off the head of his antagonist with his own weapons." In this important work, he deals with the number of canonical books, the authority of Scripture, the perspicuity (clarity) of Scripture, the proper interpretation of Scripture, and the perfection of Scripture against unwritten traditions.